A corruption investigation expected to contain damning allegations against South African President Jacob Zuma will not be published on Friday, as planned. Thuli Mandonsela, who has vigorously pursued Mr Zuma in her seven years as anti-corruption tsar, told Reuters that legal action was behind the delay. 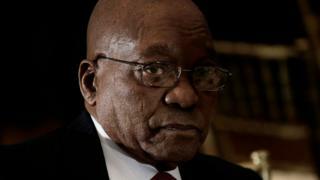 Mr Zuma applied for a court order to ban the publication on Thursday. The report addresses allegations that a wealthy Indian-born business family has had undue influence on his government. The Guptas have been accused of dismissing and appointing ministers, a form of corruption referred to in South Africa as "state capture". The family strongly denies all the allegations, as has the president. Ms Madonsela had been planning to release the findings on Friday, her last day in her role as public protector. But with legal action preventing her from releasing the report before, Ms Madonsela says she has now given "for safe-keeping" to Baleka Mbete, the speaker of parliament. "I'm not the whistle blower. I'm the one who investigates what the whistle blowers tell me," she told a press conference in Pretoria, at which she reiterated several times that she was not able to discuss the findings of the report. Former Finance Minister David Van Rooyen has filed a separate legal application to block publication of any aspects of the report involving allegations against him. When Thuli Madonsela's daughter asked her over breakfast how it felt to be "South Africa's biggest tell-tale", the public protector just smiled. It was an understated reaction from the woman likely to go down in history as the person who rattled President Jacob Zuma more than any other figure in contemporary South Africa, exposed the growing fissures in the ruling African National Congress (ANC) and went from being a shy trade unionist to an internationally feted global leader. Ms Madonsela's inquiries over her years in office as public protector have led to the sacking of some of the most senior figures in the country. She has investigated police chiefs, opposition politicians - and even the president himself over multi-million dollar security upgrades to his private Nkandla home. The controversial appointment of Mr Van Rooyen, who lasted just three days in the post before standing down, is one of the key lines of inquiry in the investigation, the BBC understands. The report allegedly contains evidence based on mobile phone records that Mr Van Rooyen was at the home of the influential Gupta family hours before his shock appointment as finance minister, according to details of the report leaked to the BBC. Markets panicked over Mr Van Rooyen's controversial appointment, which followed the sacking of his respected predecessor Nhlanhla Nene, causing the South African currency to plunge to record lows. Critics of Ms Madonsela claims she has exceeded her powers and is on a mission to try to topple President Zuma but she maintains she's just doing her job. In a previous report, she found that Mr Zuma had "unduly benefitted" from the use of taxpayers' money to build a cattle enclosure, amphitheatre, swimming pool, visitor centre and chicken run at his home in Nkandla. Last month, he repaid about $500,000 of the $23m total cost of these upgrades. In March, the Supreme Court found he had breached the constitution by not paying back this money. Jacob Zuma painting: Are South Africans 'too free'?